I'm a little concerned about the write feature and changing any current data in QuickBooks from the Excel files I want to experiment in. Are my concerns valid or what is the best way for me to prevent that from occurring? Updating any record in Excel sheet will not fire update command or change anything on QuickBooks (unless using VBA script). 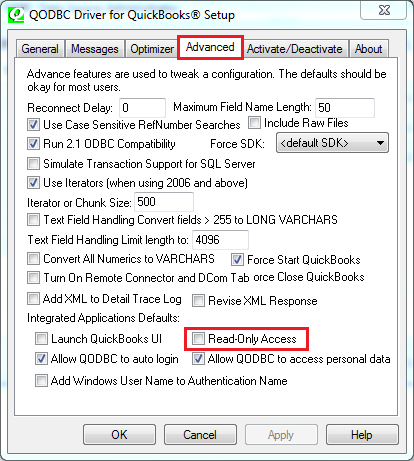 For better security, you can enable "Read-Only Access" feature from the QODBC Advanced tab to avoid any application using QODBC to Write to QuickBooks. Start>>All Programs>> QODBC Driver for use with QuickBooks>>QODBC Setup Screen>>Advanced Tab>> Enable "Read-only access" option. & apply the changes. You can make a copy of the company file and test on that. So your original company file will be safe. You can take backup company file & restore it whenever needed.